There are so many wonderful designs available that celebrate every season and occasion under the sun... so we thought it'd be fun to collect a few of them, and organize them for you on a set of Holiday/Seasonal Pages. I'm a "seasons" nut... so we'll be adding to these all the time! We have so many other projects and ideas in the shop, and elsewhere on the site, but this is a fun way to show you just a few ..... ENJOY! Oh my gosh, this is the cutest and funniest collection of little bikinis that someone you KNOW would (or shouldn't !) wear! OK... THINK about ladies you know... Santa Baby - who is getting married at Christmastime? Whose husband plays Santa Claus every year? Melons? (Who do you know that has a set of those?) 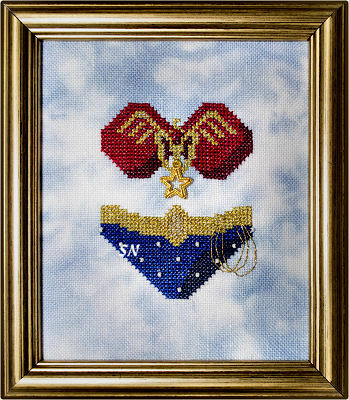 Super Heroine - what a fun thing to stitch for someone special who has saved your life! We have 13 different bikinis in this collection... and they are AWESOME! One of my favorites is the police woman - she has hand-cuffs and her charm in a gun!!! There's a nurse that might like this stitched in her locker at work - to remind her of off-time from her stressful job... there is an Autumn one for the chick who just cannot let Summertime go... and *God Save The Queen* -- a British one!!! (There is even a Bavarian one with a pretzel!) 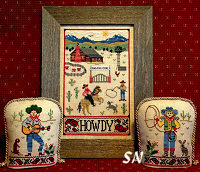 Each is offered as a small chart with its special charm and measure about 50 x 60 stitches in size. They are coded for DMC flosses, maybe a few beads, occasionally a metallic or fuzzy thread... all normal things you have in your stash! Cute as can be! Float your mouse over each image to see its name. Oh my gosh, this is the CUTEST thing for your hacienda! We don't have those awesome mountains in Oklahoma, and not too many cactus, but we have the hats and the boots, the windmills and prairie dogs, and those paisley bandannas! 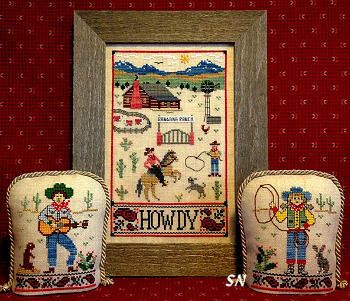 This chart features the main piece (5 x 8-ish on 32ct Lambswool) -- add your ranch's name or family name on there -- along with the boy and girl individual 3 x 4 stand-up designs. 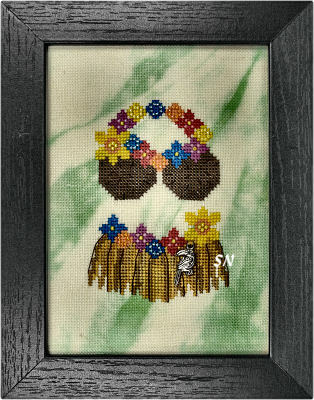 Charted for DMC and Sampler Threads, add beads if and where you want. We don't get many cute designs with this theme... so don't pass this by -- it is really cute! It's a garden of summer color... all the rows of vegetables and flowers are lined up... blooming all throughout the garden! By Carolyn Manning, this is a fun design offered in leaflet format. It's simply a design of small borders that are arranged together to give you a 138 x 138 square of color!!! 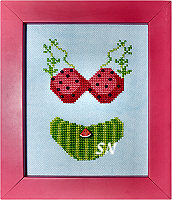 Regular Cross Stitches, this is charted for DMC floss. 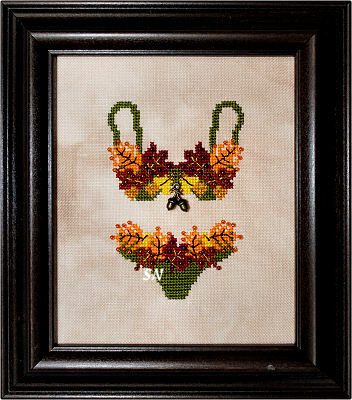 If you're an over-achiever, you can always add hand-dyeds, beads or special stitches... but the Cross Stitch Police will not come visit you if you simply enjoy this with regular 'ol *X's! It's very eyecatching! Lindsay Lane has a pretty floral basket to celebrate the last fleeting days of Summer. Just a simple thing, it needs to be stitched on a soft, neutral shade of whatever fabric you like best. It uses Weeks Tarragon, Brick, Whiskey, Red Pear, Cognac, Cadet, Grapevine, Juniper and Parchment.
. We have several other things by Lindsay Lane -- including Halloween and Autumn... but I couldn't resist this boquet! Oh, here is a charming Spring-Green painted wooden hornbook that measures 4 x 6, is pierced with 5 tulip flower designs, that displays a pretty band sampler of garden flowers! 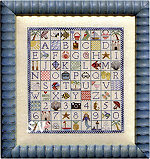 Offered as the chart with painted hornbook, and two sets of three hand-made clay flower pins each, you'll need bits of DMC floss and a 9 x 9 cut of 32ct Petit Point Natural Line -- with little white polka dots on it. Stitch the cute little garden with 6 colors of floss. make the mattress, glue it to the painted paddle, and add your pins to each side... SO CUTE!!! Simona lists this as *Hornbook Series #1* so I assume there will be more that go with this -- but we have no information on that. Just enjoy this one for now! 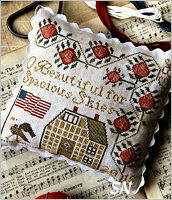 Heartstrings Samplery has a new design -- For Spacious Skies -- that 'pops' with patriotic red colors. Work it on anything you like -- stitch count is 110 x 100. Weeks flosses of Grits, Schneckley, Palomino, Grape Vine and Collards along with Sampler Threads of Brethren Blue, Pomegranate, Endive and Ruby Slipper -- I just love the red color and the green leaves against the light fabric. The pattern of the leaves is small and repeating -- just like the bricks on the house -- it all has a neat balance to it. Offered as the chart. Sam Sarah Studio is beginning a new set of designs that she is presenting in chart format with a small packet of button embellishments. Named 'Over the Hill' because each as a 'hill' shape near the bottom of the design, she is presenting them on Weeks 20ct Blue Jeans Linen and stitching them with hand-dyed Caron Collection Watercolors thread. They finish approx 8 x 8 if you choose the large count fabric. The larger version uses the same scroll hanging hardware that her Something Wicked Mystery Sampler used -- so if you have that already, take if off your Halloween piece and use it for these. If you opt for the smaller linen, maybe a stand-up cube for finishing??? Anyway, Watercolors, Linen and Charts are all offered separately, so you can choose options. Bent Creek has sent the third and final design in this 3-part piece -- just like all the rest of their Mantel designs -- the whole thing finishes approx 10 x 22. Offered as three separate kits, the first part had the 18ct Natural Linen cut in it, along with threads and the pattern for the left-hand 1/3 of the design, as well as the bottom festoons. 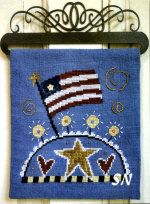 Next, came part two -- it has the bird, star and part of the flag along with threads. Finally, this part - #3 - has the rest of the house and flag, Uncle Sam and the Sign and threads for those. Each of the three parts can stand alone -- but they are fun joined together. Super easy to stitch on the 18ct with #5 Pearl Cotton -- it'll stitch in no time at all!! 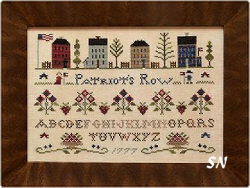 Little House Needleworks has a new design -- Patriot's Row. It'll finish approx 7 x 11 on 28ct. Coded for DMC along with Classic Colorworks hand-dyed floss, it is kind of a neat design because I can see three different parts. The row of houses -- love all those skinny windows! The row of berries and flowers, and finally the row of the alphabet and date. I just now see the little Betsy and Sam in there as well!!! Offered as a chart. This is delightful, and I just HAVE to share it with you! A Summer Seaside Scene, I'm not sure what my favorite design element is in this. The Little Gnomes with their pointy hats... going swimming??? The umbrella is delightful, the tiny flags are festive. The hearts in the air are cute, the little swimmer on the polka-dot innertube is precious -- see her braids trailing behind? I like the beach shack and the gulls perched everywhere... but I think the itsy-bitsy fish in his bowl -- with his OWN little pointy hat -- is so funny. This has a stitch count of 285 x 157 and will finish approx 18 x 10 on 32ct Vintage Country Mocha Linen. Beautifully charted in color, the verse is presented in both English and Italian, and it calls for DMC floss. I think it's just the cutest thing... very different and endearing! Offered as a chart. This is a sweet summer scene that I couldn't resist, brought to us by Madame Chantilly. A generous 236 x 102 stitches, it'll finish approx 17 x 7 on 14/28 fabric... the picture was stitched on Natural... but a light blue or yellow would be pretty as well. All the beach cabanas are lined up, the seagulls are swirling, the crabs are waiting in the water, and the tiny airplane in the sky is advertising that it's the HOLIDAY! Something about it makes me think of summer vacations of years ago. Add some gull buttons, a tiny shell or two, maybe a bit of metallic on the plane, hand-dyeds for the rocks, Simply Wool for the gulls, even some bitty black beads for the crab eyes! Offered as a chart. The gals at Fern Ridge have presented us with the most CHARMING Deep Blue Sea Silk Sewing Bag and Beaded Fob Set!!! I don't even know where to begin describing this beautiful set of artwork... it truly IS beaded and textile ART! The silk bag is made of Aquamarine Silk Dupioni fabric. 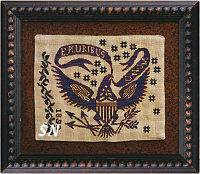 It is garnished with your stitching on 28ct Tempest hand-dyed linen by Picture This Plus. The COMPLETE kit (which is absolutely intoxicating!) includes Treenway Silks in Mermaid Tears, Sea Spray and St Thomas hand-dyed colors. There are starfish, seahorse, scallop and fish charms in here... beautiful tiny shells and glass beads... teeny buttons... Delica beads, Hannah silk ribbon -- Sea Goddess color! -- abalone buttons, a wooden ruler and wooden shell needle keeper (by Doodlin Around Design), a starfish waxer, and a real starfish that you'll use as a threadwinder! The verse by Anne Lindbergh reads: Patience, Faith, Openess -- is what the sea has to teach. A Gift From the Sea. You can see my hands in our pictures... this finishes approx 4 x 5. Absolutely GORGEOUS! A small matching beaded fob to go with your awesome Shell Purse, the beaded part of this is really very easy to stitch... just hard to teach someone else to do! The fringe looks like the hard part... but it is the easiest! You are stringing together a multitude of exquisite little shells and charms and findings. Luscious aqua blue and deep sea green colors in here! Offered as the complete kit! Make SURE to see the rest of Pat and Peggy's Things... Just the coolest!!! From Every Mountainside (also shown at right) was their first design... and now, here is the companion. You'll need to choose some hand-dyed cottons, and a pale blue linen color. This is offered as a chart, with that small wooden hornbook separately. This is a neat piece for someone who likes to Garden. The kiss of the sun for pardon, The song of the birds for mirth, One is nearer to God's Heart in a garden, than anywhere else on Earth. Stitched on basically any fabric you like best, the stitch count on this is 109 x 108. It is coded for Weeks and Gentle Art hand-dyeds -- but you can easily sub DMCs from the cover pic if you need to. Just a cute little piece. it is offered as a chart. Hitting the road this summer??? Stitch something for that Home Away From Home! With a stitch count of 114 x 42... it's a bitty thing, and can we worked on any fabric in any colors to match your moving decor! Offered as a small chart. Here's a cute trio of small pin cushions by Teri Richards. Calling for only 7 different overdyeds, each is stitched on a 32ct fabric -- but you are welcome to choose any colors or counts you like. Since they are so small, just a scrap will do. Garnished with a few clay star buttons, they finish only 2 x 2-ish to 2 x 6 for that darling floral 'flag.' Very cute and quick, clay embellishments are offered separately from the chart. 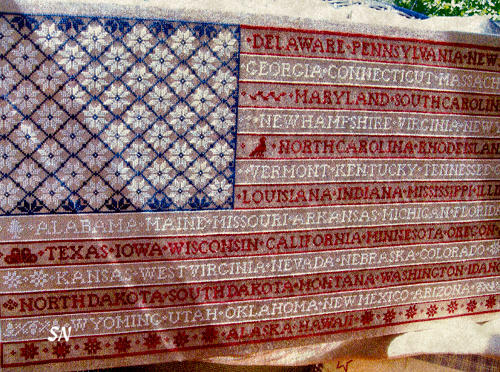 Bent Creek has a new kit -- a red, white and blue confection of stars that make up a flag. It finishes approx 6 x 6 over two on 18ct Natural Linen, and is worked with DMC #5 Pearl Cottons. SUPER easy to see and stitch, make sure you have a large #18 or #20 needle... I don't see one in my package! Something fun to finish in a jiff! 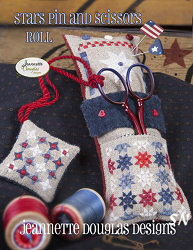 Wow... my buddy Jeannette Douglas has released a trio of patriotic designs that are stunning! (This is cool because she is a Canadian... but she 'gets us' so well!!) 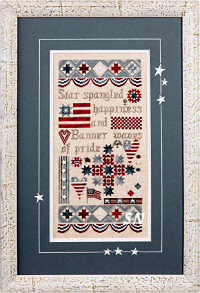 Patriotic Sampler is so "Ding Dang Cute" in Jeannette's words... it finishes 6 x 12-3/8 on 32ct Lambswool Linen. Stitched in elegant cranberries, greys, blues and creme silks this piece is LOADED with gorgeous medallions and special stitches. The stars at the top and bottom are over 12 threads. Bargello waves and those cute stars and stripes hearts in there -- the colors are rich and yummy. That whole star motif area is 60 stitches square... so you have to count correctly! The bonus, however, is to watch the shading in your threads play out in the stitch patterns. 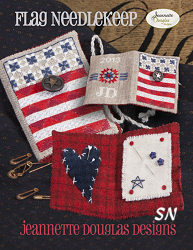 The silk thread packet includes a set of 12 buttons and eagle and flag charms. Just lovely, this is offered as the leaflet with thread pack separate. This is a delicious little creation... worked on 32ct Natural Linen in Gentle Art Simply Wools, it is a cushion that measures approx 2-1/2 x 6-1/2 when finished. Buckeye Scarlet, Schoolhouse Red, Oatmeal, Roasted Marshmallow, Midnight, Dungarees and Old Crow, gorgeous, rich colors, they all make the Scotch, Rice and Milanese Stars pop! The big white star at the top goes over 44-ish threads. No Cross Stitch in this at all -- just those beautiful Long Stitch Variations. This is offered with the chart, Simply Wool threads, a smattering of 6 mini-buttons, and the cuts of Weeks hand-dyed wool -- the deep blue and red Glen Plaid -- for the finishing. You'll need stuffing. As for the little fob pictured there... it is a FREE chart... details inside! A companion piece to the Stars Roll, this features the same color palette of Simply Wools -- Buckeye Scarlet, Schoolhouse Red, Oatmeal, Roasted Marshmallow, Midnight, Dungarees and Old Crow -- just a gorgeous selection. Worked on 32ct Natural Linen, this finishes approx 3-1/4 x 4-3/4. Stuffed with cool stitches again, the entire red and white striped part is done with small Satin Stitches. Your two reds give you that color play on there. Offered as a small kit, you get the chart, Simply Wools, buttons and the blue wool for the little heart, and red for the case lining. Jeannette added her own decorative brass button to the front of the case -- that is not included -- but she suggests something special from your stash that you like better! A lovely small project with lots of stitching and color impact! Aren't these neat designs? Stitched on virtually any fabric you like best... choose a single color of floss... and stitch a memory of childhood. If your little person needs to be a girl -- everything is charted with an optional pony tail!!! Finishing various different sizes -- these are generally 4 x 6-ish in size. Each chart includes a heart charm embellishment -- always tucked up high in one of the trees. Timeless designs, not cluttered. They'd make neat photo album covers! We have four new kits by Curly Girl Designs that are full of personality and inspiration. (#'s 13, 14, 15 and 16 in this collection of designs!) Stitched on either Navy or Star Sapphire 28ct linen in loads of DMC flosses, these feature small bits of beaded embellishment... but much more Cross Stitch than beading. Finishing approx 7 x 7, they are colorful, fresh, young, upbeat, and VERY up-to-date. Stitch these for any young lady in your life -- and she will love you! Sparkle -- Every once in a while we get a moment when all the world needs us to do is just stand there and sparkle! OHhhh... isn't that neat? What a wonderful way to commemorate a special occasion or life milestone... or just a special personality! Worked in tons of white with some opalescent metallics on navy. Dandelion -- Someday is made up of a thousand tiny nows. Every marvelous possibility is a bundle of very little things... Stitched on 28ct Star Sapphire Linen, SO simple and stunning! Fireflies -- If there was never any darkness, we would never see the fireflies. Something to remind us that there is good in so many things... and that we can get through things...to the other side. Stitched on Navy... the beads in this are super bright -- just like the fireflies! Lots of Patriotic from Priscilla's Pocket!!! A TERRIFIC Miniature Wooden Thread Keep -- along with a pair of great charts -- these are beautiful, timeless designs. First, that little flag! 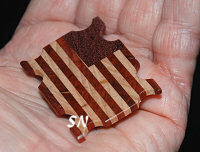 It is a hand-made piece of wood -- different varieties layered together like a cane of JABCO button clay -- then it is SAWED (sliced) to make this lovely 1-1/2 x 2 inch miniature flag!!! Beautifully rounded and finished, I'm not sure you actually want to cover it up by winding thread around it! 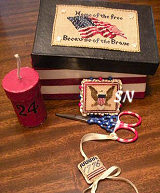 STUNNING inside of any patriotic sewing case! It's a pricey little thing, and we don't have many... but it's a gorgeous piece of art! So classic in design... this is stitched over one on 28ct hand-dyed Straw/Gingham linen in only one color -- Weeks Kohl hand-dyed floss. Measuring approx 7-1/2 x 8 -- this will make quite a visual statement in your surroundings. You can choose the same gingham linen in 28ct and work this over two threads instead -- you've just create a larger piece at 13-1/2 x 16. Offered as a chart -- this is very clear and looks like it'll be fun to work on! Here is a charming patriotic homestead -- bursting with flags and splendor! Something about all the diagonal lines in here draws my eye! The quilt motif, the flags, Betsy's dress, the edges of the lawn, and even the flower stems! 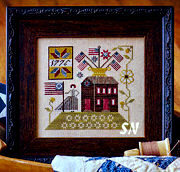 Designer, Paulette, offers a few history tidbits about Betsy... she was born in Philadelphia on New Year's Day in 1752. She was a Quaker, but when se ELOPED with John ross in 1773 (can you imagine the scandal back then?) she was forced to leave the Society of Friends. She and her husband started their own upholstery business and joined the Christ Church in Philly where they met George Washington, who was also a member. 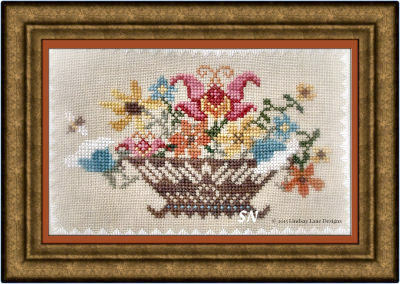 A sweet little piece, this finishes approx 6 x 6 on 32ct, is worked with Gentle Art Sampler Threads, and is offered as a chart. Just something fun by Silver Creek Samplers, this measures 66 x 114 stitches. Cute finished as a sandwich-sign stand-up or a little fabric wallhanging quilt! Well, if this isn't the coolest little set... since it's stitched entirely with beads... you CAN'T HELP but cradle it in your hands and fall in love with it! It's heavy in your hand, and very tactile. 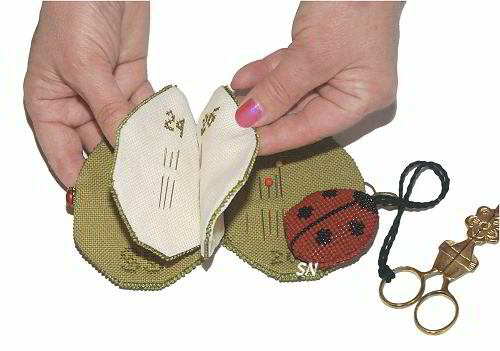 OK... begin with 25 count Lugana -- the leaves that are the front and back of the needlebook are stitched on that. 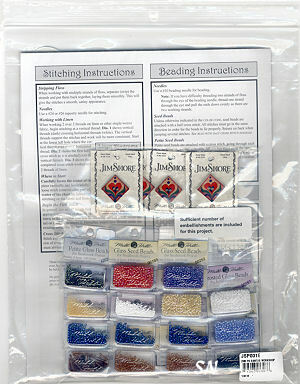 Next, the inside pages are labeled in cross stitches with your needle sizes to help you organize in there. Finally, the ladybug is worked on 25ct Victorian Red Lugana. Wonderful, sturdy fabric for this piece... the chart and assembly instructions come WITH the beads -- which are ever-so-slightly larger than Mill Hill's. See the little Just Nan Ladybead on there??? 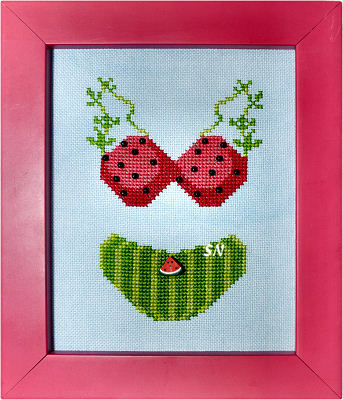 She's an extra little decoration... and well... we have wonderful scissor options for this piece as well!!! Chart comes with the beads and assembly instructions. Fabric, Ladybead, and scissors all offered separately. Freedom*Liberty*Justice! What a perky and cheery pot of Americana! The lavish bouquet of stylized flowers bursts like fireworks from that little pot and the blowing flag is extra-festive. The edge treatments look like the edges of penny rugs -- small circles of wool -- pennies. These are stitched instead, but mirror the swirls and stars from the flowers. Stitched on almost anything you like, the threads called for are Weeks hand-dyed cottons and your stitch count is 163 x 78. Just something cute that came through the shop this summer!!! Next, is the tiny mattress -- it features E Pluribus Unum on one side, and the American Eagle on the other -- all in 35 x 40 stitches. Finally, the EXQUISITE little fob rounds out the set -- it is 20 x 20 stitches -- so approx 2/3 of an inch in size! Absolutely enchanting! Color pics are included in the directions for mattress assembly, including that rouched ribbon edging, making the interior firecracker boxes, and even painting the 4 x 5 paper mache' box from the craft chain store. Wow... this is a neat piece! It's a flag of the United States... but the stripes are made up of the names of the states, in the order in which they joined The Union! 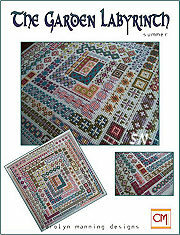 Offered as a chart, the stitch count on this piece is a generous 210 x 400 -- 13 x 25 on 32ct! Stitched in ONLY Crescent's Cupid, Blacksmith Blue and Antique Lace hand dyed colors, it's just stunning! 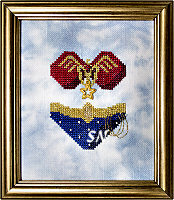 The stars are all Cross Stitches... but you could Satin Stitch them if you like. 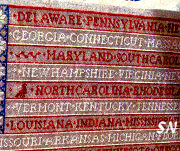 (As a bonus... there is a listing inside of the actual dates each state joined the Union -- kind of fun trivia to know!) A lovely piece for a family room, classroom, library or office! Another itty-bitty seasonal wonder... remember, these finish a mere 1 x 2-ish... in TOTAL SIZE!!! 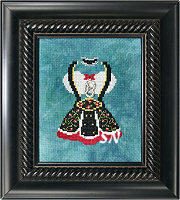 The design comes charted like a regular cross stitch design... and includes a cut of 40ct silk gauze. Freedom Bits joins this delightful collection of tiny seasonals... each one is as cute as the other!!!! Each framed piece fits easily into my hand... SUCH an eye-catcher displayed individually on a small plate easel! Olde Colonial makes the little frame you see here... We can send the chart (that contains the little piece of gauze) and that petite frame! Zip-Zap - you add schnigglets of your flosses to stitch this in about 15 hours... and you're done! Wow... Erica Michael's Linda Stolz has really outdone herself with this one! An old-fashioned flag design, stitched in overdyeds... you can stitch this on any count fabric you like... or try the 40ct silk gauze included in the design package! On 28ct... Grand Old Flag measures approx 3 x 5... BUT... if you decide to be adventuresome, and work on the gauze, you will be transported into Bliss! Grand Old Flag will measure a mere 1 x 3-1/2!!! From the original artwork of Jane Wooster Scott... this is exquisitely charted by Heaven & Earth Designs! 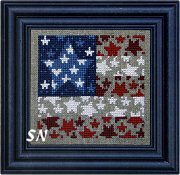 Absolutely HUGE, solid stitching, and breathtaking in presentation... we have several other really cool Summer and Patriotic scenes like this one, to enjoy! Definitely a family heirloom -- if you *live through the stitching! 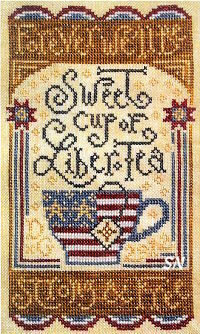 * -- these lovely Summer and Patriotic designs are simply a treat for your *Wanna Stitch Someday Stash! * Measures 450 x 379. 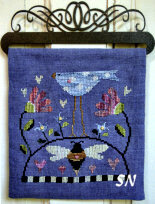 A cute, primitive piece, this finishes just 4 x 6 on 32ct linen, and is stitched with Weeks Dye Works flosses. Nothing super unusual... but it just has a charming feel about it to me! Available as a single chart leaflet. 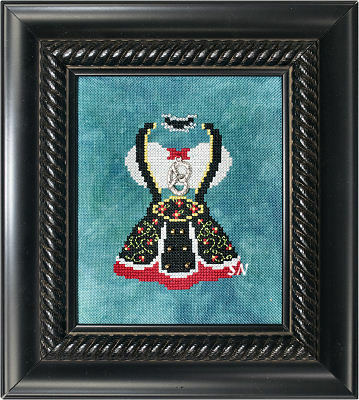 Mill Hill has licensed the artwork of Jim Shore and charted his designs into cross stitch! The first three publications are here, and they are stunning! Offered in leaflet form, each is stitched with DMC flosses and embellished with Mill Hill beads and MH's Jim Shore buttons. 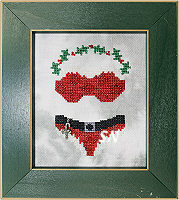 Santa's workshop finishes approx 12 x 15, Harvest Trio finishes approx 5 x 12, and Awaken finishes approx 8 x 10. So colorful and pretty, we've packaged the beads and buttons together if you need them! This is a set of miniature wool candle mats... all created with our Weeks Dye Works hand-dyed wools!!! NO Cross Stitches involved... no sewing machines... these are tiny 10-inch round mini-mats -- doilies -- if you will. 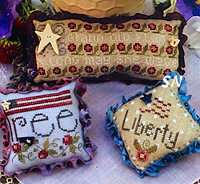 Designed to be Straight Stitched out of wool pieces... think about Punch Needle for these! Offered as the line drawings, they are PERFECT for punch, as well as the wool! Now, in most Primitive-Stitch wool projects, you Blanket Stitch everything together. Blanket gets confusing when you run out of thread and turn corners... but these aren't like that! These just use little TACK STITCHES to attach everything! Look at the little chicks -- you can really see what I mean on that one! These are absolutely the most charming little things! You'll need a 1/4 cut of Weeks wool for your background piece... choose black, it's the 1/2-inch piece showing as the outside border. Then, we sell *millions* of Schnigglet pieces -- 8 x 8-ish in size -- and several of those are all you need for all the cut-outs! If you're going to punch instead... use a 3 strand needle... or even a 6 stand for the background! 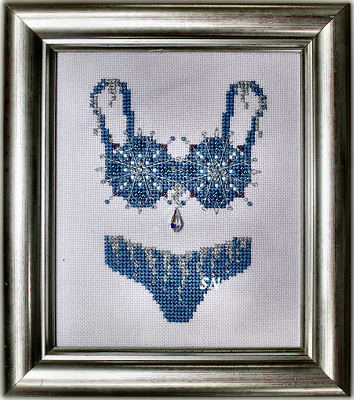 Absolutely nothing to do with Cross Stitch... I fell in LOVE with these when I saw them... I couldn't help myself, and I bought them all!!! Offered as actual sized line drawings ready to be traced and cut out. Wool Combination 'recipe of colors' also included. 1/4 Yard wool cuts run $23 each... Schnigglet cuts $6.00 each. Use the Comments Box to tell us if you want wool... and for which pieces! Or just go to our Weeks Wool page and go for it! The last in the Summer Snapperland set is finally here!The first design is darling... it's a tiny beach house, complete with a whale weathervane and little red crab on the sandy beach! Offered as the small individual card, there are snap embellishments included for the each design. As with Spring and Winter Snapperland, Bent Creek has designed a really neat border chart, so that you can stitch all four designs in this mini-set as one bigger design. That border design reads, 'Turn your face to the sun, and the shadows fall behind you.' Along with the sunshine and shells, there are seahorses in the border design as well, and the special embellishment package contains more snaps, clay sand dollars and a sea scallop. Stitched on 32ct Rue Green Belfast Linen... each design finishes approx 3 x 3. 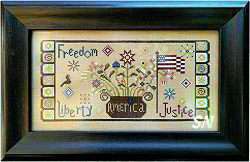 Stitched together with the freebie border, the entire piece finishes approx 5 x 15. SOOO cute! This is the cutest one of these! Check out those little doodle-ladybugs on there! Finishing a whopping 2 x 19... this whole set has been fun, because it's perfect to hang on that skinny wall everybody has between two door frames! The other three Soapboxes are pictured on the back cover, so when you get this, check your stash, and make sure you have the other three! You could even get industrious, and stitch all four side by side on one chunk of fabric, add some clay buttons, and make quite an impressive piece! Summer Soapbox is presented as a leaflet. Blue Ribbons's newest checkerboard design, this one is stuffed full on 'teeny-weeny beachy' things!!! Mixed in between the alphabet, you'll find sand castles, fish, mermaids, a bikini, sun tan lotion, a camera, octopus, beach ball, sun glasses, a cool tropical drink, flip flops and sea shells, palm trees, a sea horse, a flamingo, sail boats... I'm going on and on!!! Darling, it is offered as a chart, and finishes approx 9 x 10 on 32ct. Stitched in Crescent Colours overdyeds or regular DMCs... the border is worked in Fishbone Stitch, and I bet you can find lots of other places to add other fun stitches and a few cute embellishments! Cute and different! Oh... this is so pretty! A balanced little row of organized summer flowers... do you think the kitty knows the rabbit is hiding between them? 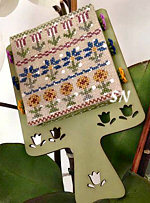 Offered as a chart, this is stitched on 32ct Waterlily linen in 18 luscious shades of regular DMC floss! Finishes approx 5 x 10. So cheerful! 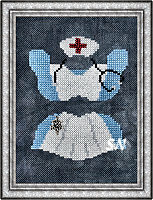 This is a sweet piece stitched in both Crescent and DMC flosses. Finishing approx 6 x 6 on a 28ct cream, I love the dusty pink and green shades! 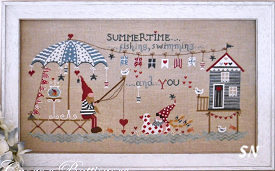 One of three stunning new pieces by Jeannette Douglas... Seaside Stitches is full of special stitches, intricate motifs and stitch details, and special threads! Stitched on 32ct Meadow Mist Belfast Linen in 29 different silks, hand-dyeds, metallics and a wool, the thread pack listing is a miniature 'Who's Who' in the world of threads!!! The piece finishes approx 6 x 8 and is shown on the leaflet cover in one of Olde Colonial's exquisite Birdseye Maple Dowry boxes. I can't tell what is my favorite part in all of this... there is a handpainted crab charm, lots of mermaids (with metallic tails), seashells and anchor motifs all stitched over one thread, the ship in the center has chain stitches around it... like a miniature rope. The Soie d'Alger, Silk 'n Colors, Waterlilies, Glorianna Silks, Luminescence, Princess Perle Petite, Lorikeet and Needlepoint Silks in here are a luscious blend of light, medium and dark corals, seaside blues and greens, rich jewel green and blue metallic, soft sand browns and creams... it is truly a miniature work of needleart! Offered as the leaflet with threads and embellishments, linen and box are offered separately. Flamingoes, sailboats, palm trees, orchid and orange blossoms, hibiscus and flip-flops, crabs and fish... the only thing missing from this delightful tropical sampler is the margarita drink in the pineapple -- complete with the little paper umbrella!!! 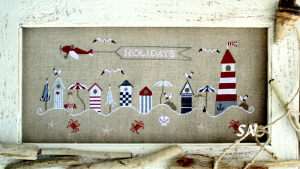 What a fun thing to stitch to remember a vacation, or to put in your sun-room, or your house in the Bahamas!!! 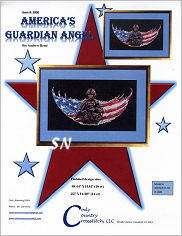 Designed by Jeannette Douglas, this is offered as the leaflet with all the necessary threads and embellishments. It finishes approx 4 x 11 on 32ct Meadow Mist Belfast Linen. The silks and overdyeds are rich, bright pinks, aquas, lime greens and yellow. The tiny embellishments include a scallop, starfish and palm trees. 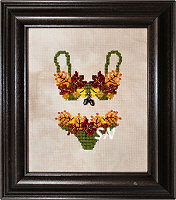 Lots of special stitches... go somewhere warm and sunny for vacation, and make THIS your vacation project! (Remember how certain projects stand out in your mind? You remember that you were stitching something in particular when something important was happening in your life... you always remember that time in your life when you look at that piece.) If you're not going to Florida, but somewhere else sunny and tropical, then leave off the place or substitute your destination. This is your summer 2006 sampler! You'll want another dark color behind this one. 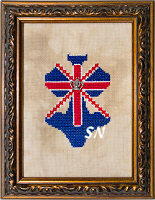 Stitch count of 317 x 168, it finishes approx 18 x 9 on 18ct! As you can probably tell from the pic, these are not for the beginner or 'weak-of-stitcher' I call them. The charts are pretty intense. You have a million color changes, and you absolutely CANNOT carry threads all over on the backside. Presents a dynamic statement to anyone!!! 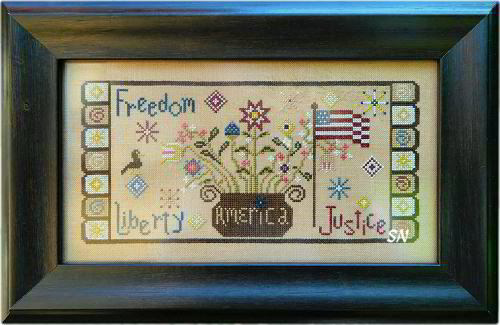 Quite a commanding piece, this is a medley of patriotic designs by Little House Needleworks that fits beautifully together nestled in a Crescent Colours frame. Stitched on 30ct hand-dyed linen (we have several Weeks shades that are awesome! ), each block is a single design all by itself... and some are garnished with clay buttons as well. Offered as a Special Release Kit, it includes the chart, clay pack of 6 buttons, and 11 complete skeins of Crescent Colours hand-dyed flosses! Finishing approx 11 x 13 on the 30ct, it fits into Crescent's navy blue frame beautifully. 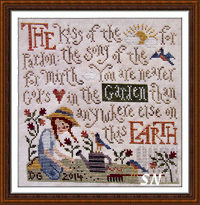 A verse taken from 'Under the Stars' by William Rice, Diane has set it to an endearing needlework design! Using pretty overdyeds, this is charted for either Crescent Colours Belle Soie Silk or cotton flosses, and finishes approx 6-1/2 x 11 on 28ct linen. Red for brave hearts, white for peace... the colors and design are perfect for a family room, and I think the finished piece would make an awesome gift! Offered as the chart.